John Sayles is one of my favorite directors because he builds three-dimensional characters that live in believable communities. These aren't the stick figures typically seen in a Hollywood picture. Working apart from the studio system for most of his career, Sayles has found a comfortable niche to make truly independent movies. The challenge in recent years has been funding his projects, and his output has diminished significantly. 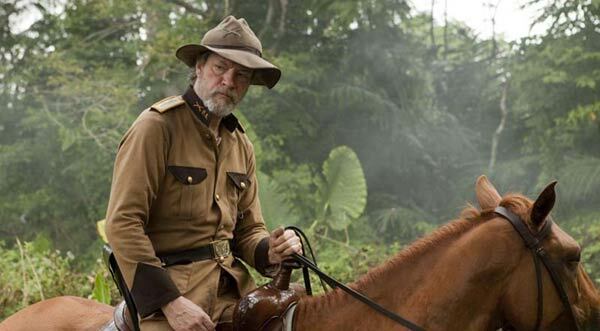 An exception is his 2010 film Amigo, a historical drama set during the Philippine-American War. It's a movie with limited commercial potential, yet the cast includes Chris Cooper, Garret Dillahunt, and other familiar faces. It's a testament to Sayles' reputation that he can still draw such talented actors to work for scale. This short marathon will knock out the only two of his movies that I haven't seen. Both aren't well-known, even if you're familiar with the director's work. Let's begin by heading to the Philippines and checking out his most recent film. In 1900 during the Philippine-American War, Rafael Dacanay (Joel Torre) is trying to lead his barrio of San Isidiro under increasingly difficult circumstances. 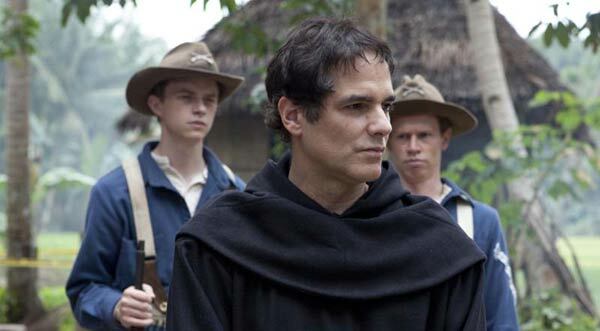 His brother Simón (Ronnie Lazaro) is the captain of the local guerrillas, and U.S. soldiers have set up camp in the village while battling his forces. Lt. Compton (Garret Dillahunt) tries to get along with the San Isidiro residents while serving the orders of his superior Col. Hardacre (Chris Cooper). The two groups begin to form a connection, but the dangers of the war remain just outside the town. The threat of violence continues to loom over everything, and it's only a matter of time before these tensions lead to a tragic disaster. How does Sayles build the sense of community? One of Amigo's strongest elements is the feeling that we're actually visiting a turn-of-the-century rural village. Sayles clearly did his research and creates a relaxed environment that doesn't call attention to itself. He also wrote the book A Moment in the Sun about the same era, and that massive novel includes great attention to detail. In the film, the Filipino characters speak in their native Tagalog, and communicating with the Americans isn't easy. There are few obvious references to the time period, yet it seems authentic. The main reason is the relationship between Rafael and the other residents, who generally respect his leadership. Even when he's been jailed by the Americans, the people stick by him. Sayles also effectively shows the camaraderie that's built between the soldiers. In a similar way, they respect Lt. Compton despite his mild-mannered style. The cast is up to the challenge, and even bit players get their chance to shine. Sayles' experience as a novelist helps him to recognize the importance of building a community that lives beyond what we see on screen. The barrio doesn't feel like a movie set, which is quite a feat given the modest budget. Does the plot match our interest in the characters? Sayles' films are typically slow, so it's easy to criticize them for a lack of plot development. The validity of this point varies depending on the movie. His best work doesn't fall prey to this pattern because we're drawn into an interesting world. For much of this story, we're getting to know the characters as they build relationships. The war setting becomes almost secondary, and there's little need for major plot movements. It makes sense that Sayles feels the need to provide a climax, but he slides into some obvious conventions. We have a race to save a likable character from execution, but silly coincidences may doom those chances. Sayles also picks out another friendly guy and gives him a serious injury. Both examples feel manipulative and don't flow organically. It's clear that he's trying to make a point about the unfair nature of war, but it seems pulled from a lesser movie. There's too much substance and attention to historical details to decimate the earlier success. Although it takes place during wartime, there are few battle scenes. Sayles uses the down time to show the futility of this forgotten conflict. The revolutionaries are worn-down guys who believe in their cause, but they have little hope. The Americans are young novices who left with patriotism in their hearts yet have lost their enthusiasm. They're just trying to stay alive but aren't true military souls like Hardacre. That name says all we need to know about the officer. He doesn't care about treating the locals well and looks upon everyone as a possible enemy. For the most part, Sayles does a good job presenting these themes without using obvious tactics. The unjust war is the monster dividing the country, and unseen leaders have deceitful plans. The connection to recent U.S. invasions in the Middle East is definitely not coincidental. There's also a religious undercurrent from Padre Hidalgo (Yul Vazquez), a Spanish missionary working to convert the barrio. It plays more in the background as the characters try to deal with the impending doom just outside their homes. How does this movie fall within Sayles' career? Amigo rests in the middle tier of his films and explores well-defined themes in an interesting setting. The deliberate pace and some plotting issues hold it back, but there's still plenty to like. Its closest sibling is Men with Guns, a Latin American story that's even a trickier film. Both are tackling a heavy subject but manage to keep us grounded because of the emotional connection. Strong performances by Joel Torre, Garret Dillahunt, and Dane DeHaan anchor this movie and lift it above a clinical dissection of war. It doesn't rank with my favorites from Sayles' career but deserves a larger audience. Next week, I'll catch my "white whale" from Sayles and finally check out Baby, It's You.